Egg Bag brought into the 21st century! "With a degree in industrial design Ottawa-based pro Chris Pilsworth has created what can only be called, a complete REVOLUTION of the classic egg bag method, while using a natural, acceptable and innocent appearing prop - a simple paper bag. This is the ONLY egg bag I will ever use." Think about it; when someone sees you perform an egg bag routine using a traditional cloth egg bag, what do they believe? 1. You are a real magician. 2. You are only human, but possess incredible skill. 3. The strange cloth bag, like one they've never seen before, is fake, so that anyone could do the trick if they had a bag like yours. It still requires skill and practice to present a great egg bag routine, but all of that gets dismissed because you're still using a magic cloth bag. Chris faced the same issues when he wanted to add an egg bag routine to his repertoire, so he did something about it. He asked the question, "What if you were able to present an egg bag routine using a normal looking brown paper bag?" A paper bag flies right under the audience's 'suspicion-radar' and now you get the credit for creating the magic, not some unusual cloth bag. Many magicians where black/dark outfits and the classic black Malini Egg Bag simply does not stand out from their costume to be seen from any distance. With PB&E you can wear dark or light outfit and it will still stand out from a far distance. The bag isn't black or dark blue or dark whatever! It's a paper bag, which means you can see the thing from far away! You're in a home, no problem. You're in a 200-seat hall, no problem. You're in a 2000-seat theatre, no problem. Chris Pilsworth has a degree in Industrial Design (product design) and has applied his skills and talent to the design of this incredible prop. With a current trend, that is moving towards more organic props, restoring audience appreciation of the performer's skill rather than the 'magic' prop. With a brown paper lunch bag and an egg everyone knows the qualities of the props involved. There's no need for over proving or unnatural procedures. BONUS: Unlike regular cloth egg bags PB&E allows for an audible appearance of Egg inside the bag! Included with every PB&E Pro Package are two bags. These are not lunch bags or grocery bags but double layered hardware bags and they're incredibly durable. Each bag is meticulously and painstakingly handmade by Chris Pilsworth. Chris has used the same bag for a years worth of shows (approx. 200) and it is still going strong. Only purchasers of PB&E will get exclusive access to refill bags if and when they need them. Included with every PB&E Pro Package are two eggs. And these eggs are truly remarkable! Chris literally spent a year sourcing the perfect egg for this routine. Made of a durable ceramic composite, these are nearly impossible to tell from the real thing! In fact these eggs are manufactured with the express purpose of coaxing hens to lay eggs. If they can fool a hen - they will fool your audience and volunteers! 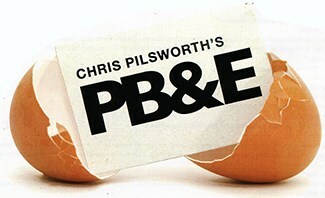 Only purchasers of PB&E will get exclusive access to extra replacement eggs if and when they need them. (Eggs come in White and Brown; please be sure you order the correct Pro Pack). •On stage in front of a family audience. •At a private party held in a restaurant. This is the only Egg Bag I will ever use." "Relevant and elegant. Love It"
"This is now my closer."